Rhode Island is home to Providence, the creative capital, but the state’s creativity doesn’t end there. You, too, can get artsy across bars and paint studios in Rhode Island, or even from the comfort of your own home. 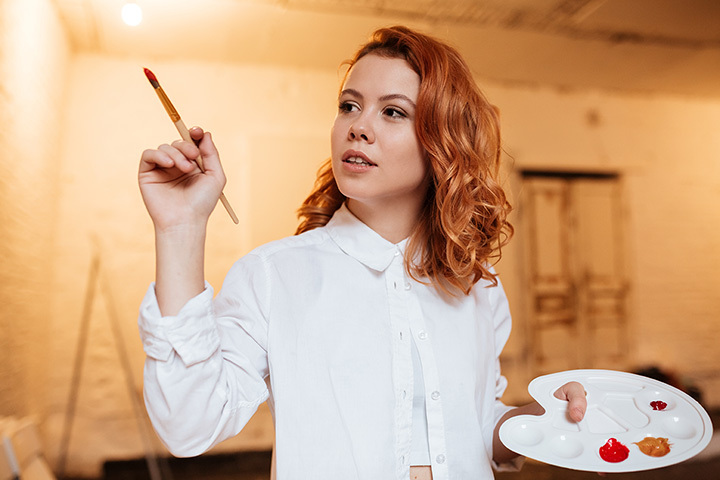 Grab a glass of wine and your paint smock, because paint and wine events are the perfect idea for a girls’ night out, a date night, or an afternoon with the family! Rachel and Paul Araujo’s studio offers the perfect inspiration for painting with its beautiful scenes of the Pawtucket Falls along the Blackstone River. Private parties can enjoy their own room separated from the rest of the studio, making it ideal for a bachelorette party or a girls’ night out. Some of the impressive 16 by 20 paintings created include replicas of “Starry Night” as well as tropical beach scenes. Located downtown on Providence’s North Main Street, the Muse Paintbar offers more than just a painting studio and bar—it’s also got great tapas like mozzarella sticks and risotto balls served all evening. Owner Stan Finch tries to work with Providence artists, including professors from the Rhode Island School of Design, to teach at his unique studios. You’ll feel like you’re learning from the best at this paint studio! Paint Nite hosts fun evenings full of booze and art at bars across Rhode Island. Come and join them at Providence’s Brass Monkey or at Arooga’s in Warwick. With a new environment and type of painting each time, you’ll be coming back for more Paint Nites across town! BYOB to this Pawtucket artist’s studio, and Paint Drops will do the rest. Hidden away in the artist community at the Lorraine Mills building in Pawtucket, Paint Drops hosts a variety of events for adults and kids alike. Don’t want to head there to paint? Paint Drops also offers in-home parties for as low as $22 per guest. Wine and Paint Night hosts paint events that will take new painters through a creation stroke by stroke. Their events are located in different bars around Rhode Island at the cost of $25 for the price of the canvas and supplies. Grab your own drinks at the bar as you prepare to paint a beautiful Rhode Island scene of the beaches or seaside cities. Drink and Dabble is a paint party company that comes to you to help host a unique and creative event. The painting parties are moderated by Charlie Hall, a local comic and artist who helps to teach painting in a way that’s fun for everyone! Led by local artists, Paint the Town Studios offers a fun and creative atmosphere, two drinks, snacks and free parking all for a reasonable price! Painters have created everything from animal scenes to scenes of Rhode Island to glass block lights, which are a unique twist on classic paintings that can be illuminated from behind, too!